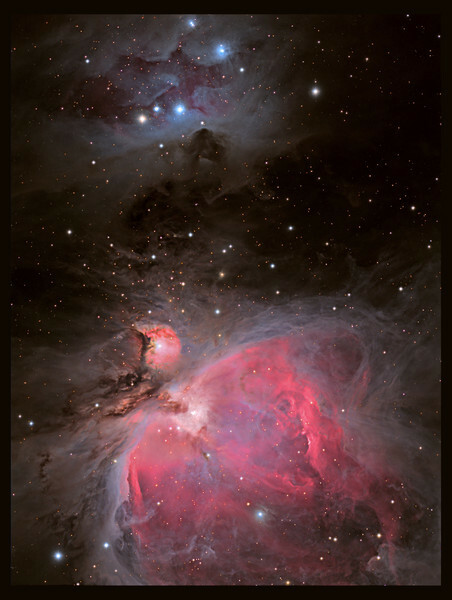 The Running Man nebula and M42 'star factory' in Orion. LHaRGB with TEC140 Af7 and ML8300 camera. Taken by Lynn Hilborn, WhistleStop Observatory, Grafton,Ontario...Feb9 and11, 2012. Sub exposures ranged from 10 seconds to 20 minutes in order to capture the full dynamic range. Directly in front of M42 is a small grouping of hot O and B type stars known as the trapezium which shine between 5th and 8th magnitude. This grouping represents the 4 brightest members of an extended cluster of several thousand young stars many of which lie unseen within the opaque gas and dust. The bright trapezium grouping represents the cluster core where stars are packed so tight they exceed the stellar concentration of our suns vicinity some 20,000 times. Stars within the trapezium are separated by only 0.12 light years whereas our sun's nearest neighbor is 4 light years away. Text was written by Robert Gendler, and is used with his kind permission.